It’s the release day @ Taylored Expressions! Yay! Yes! Today is the day. 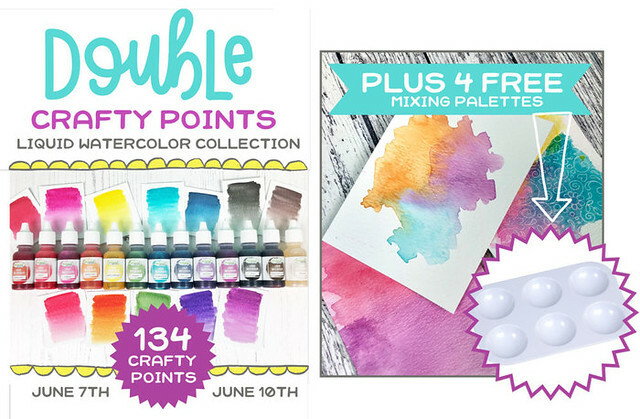 All the June releases from Taylored Expressions are available at TE store. Get your wish list out and go for it. I am sharing couple of cards today. 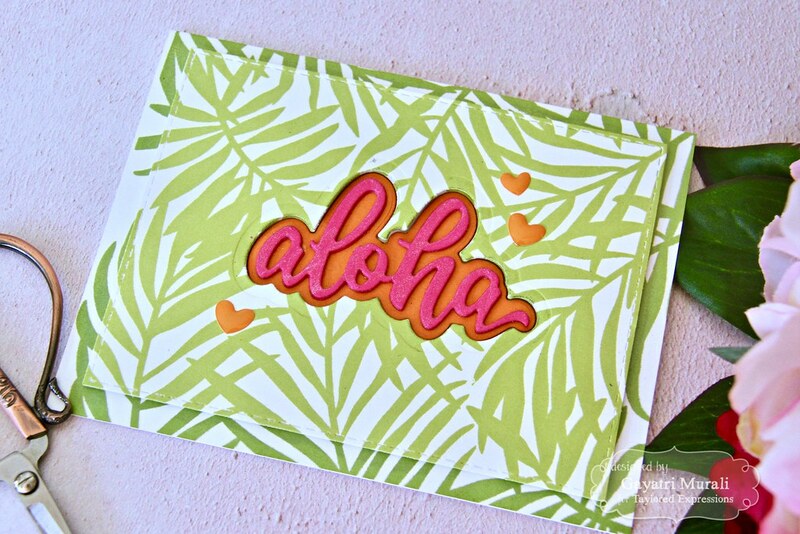 The first one showcases Aloha Script Backer die, Aloha Script die and Tropical Fronds background stamp. For the background, I used Sugar Cube card base and a Sugar Cube stitched rectangle panel. 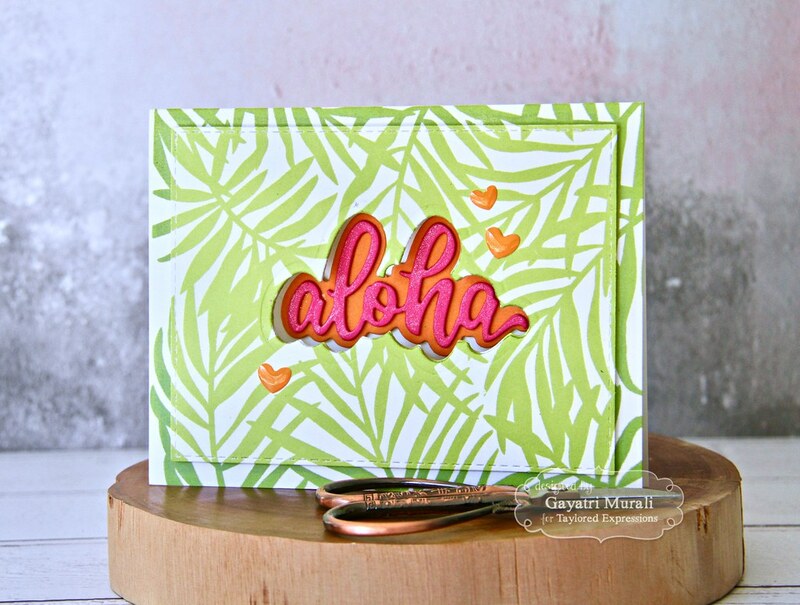 Using MISTI, I stamped the Tropical Fronds background stamp on the card front using TE Granny Smith and Peapod inks on the edges. I stamped a couple of times to get even coverage and blend of colours. Then I temporarily adhered the stitched rectangle panel on the centre of the card front inside the MISTI. 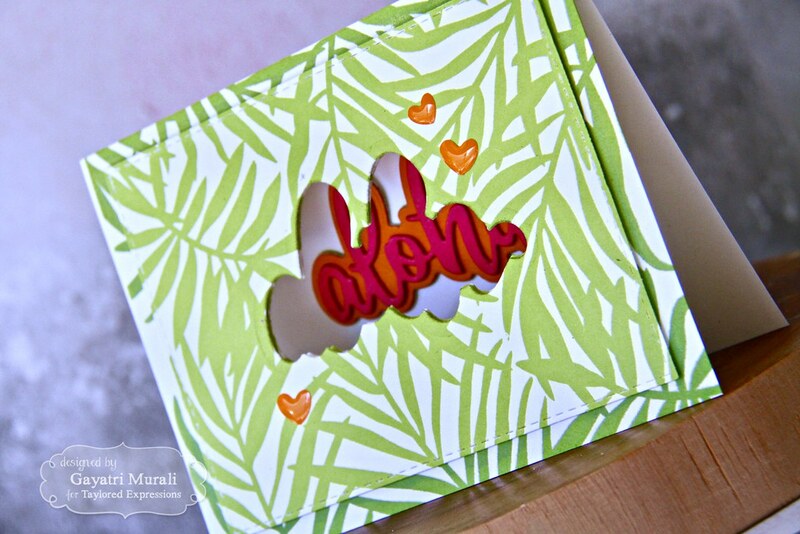 Then stamped the Tropical Fronds background stamp on the panel using the same inks. 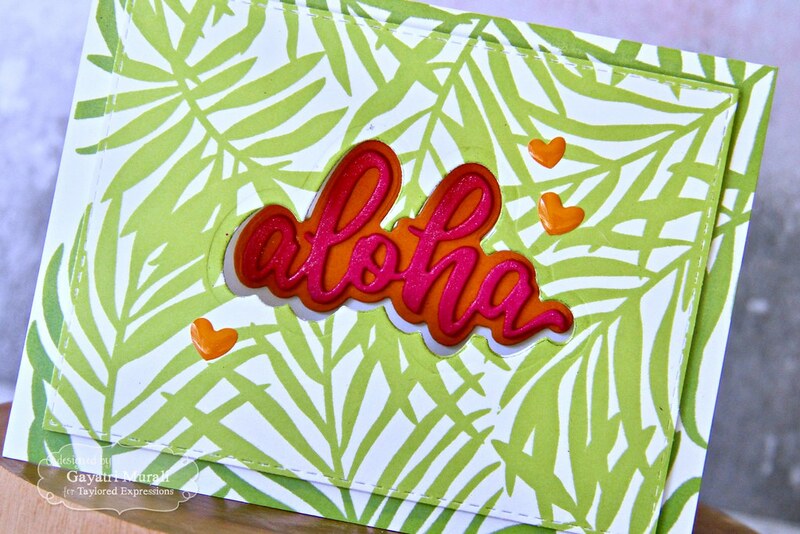 For the focal point and sentiment, keeping the stitched panel on the card front, I die cut the Aloha Script Backer die on the centre making sure to open the card base. So the backer die cuts through the stitched panel and the card front. So there is a window. 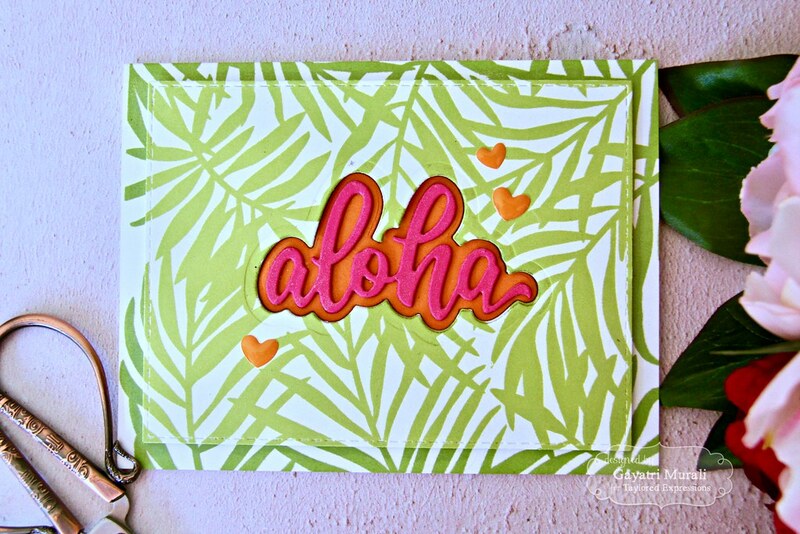 Then I die cut the Aloha Script Backer die using Candy Corn card stock. 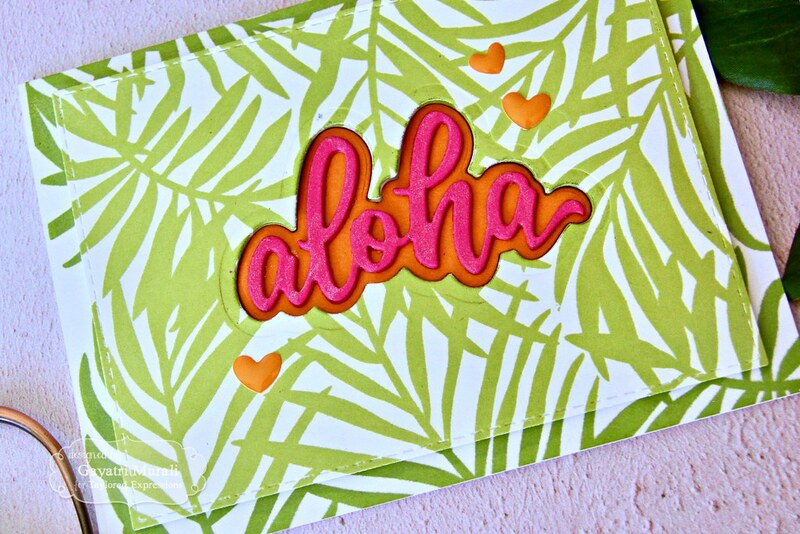 Then die cut five Aloha Script die using Lollipop cardstock. 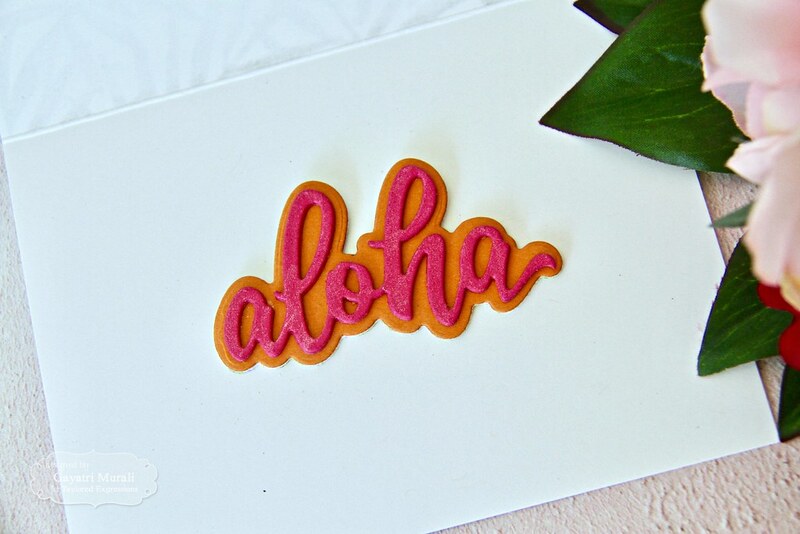 I stacked and glued all the five Aloha Script die cuts and brushed Wink of Stella clear shimmer on the top. Then adhered the entire stack on the Aloha Backer die. 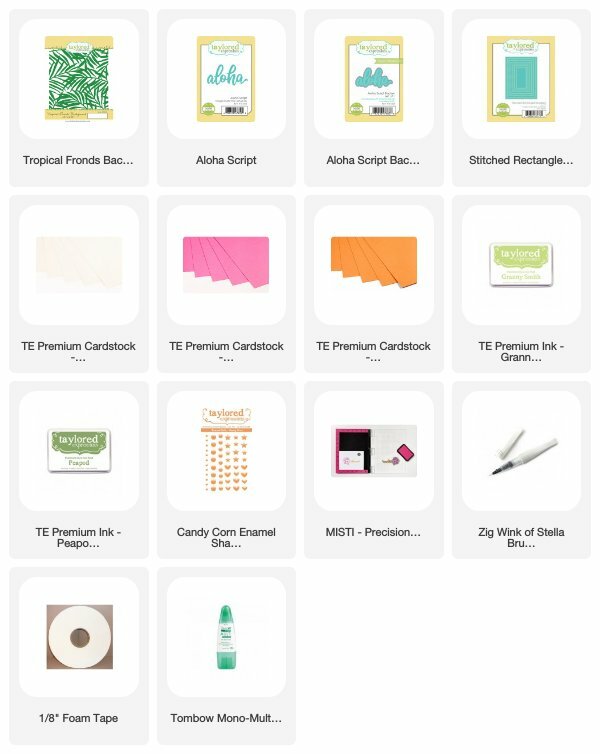 To assemble the card, I lined the stitched rectangle panel with the window of the card front and adhered using foam adhesives. Closing the card, I glued the sentiment die cut through the window inside the card. Now when the card is closed, the sentiment is seen through the window on the outside. When the card is opened the sentiment is on the inside of the card. To tie in the orange backer, I added three heart enamel shapes from TE Candy Corn enamel shapes. Simple card but still has a technique and an window element. The tropical colour scheme is bright and beautiful. Hence I love this card. All supplies used to make this card are listed below. The second card is a it elaborate. 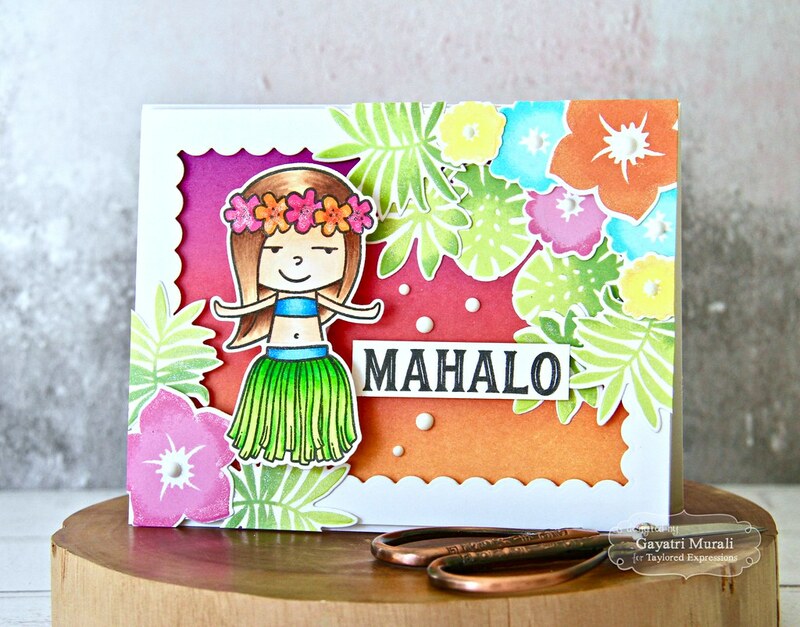 I have used the new Do the Hula stamp and die combo along with the Tropical Floral stamp set and coordinating dies. 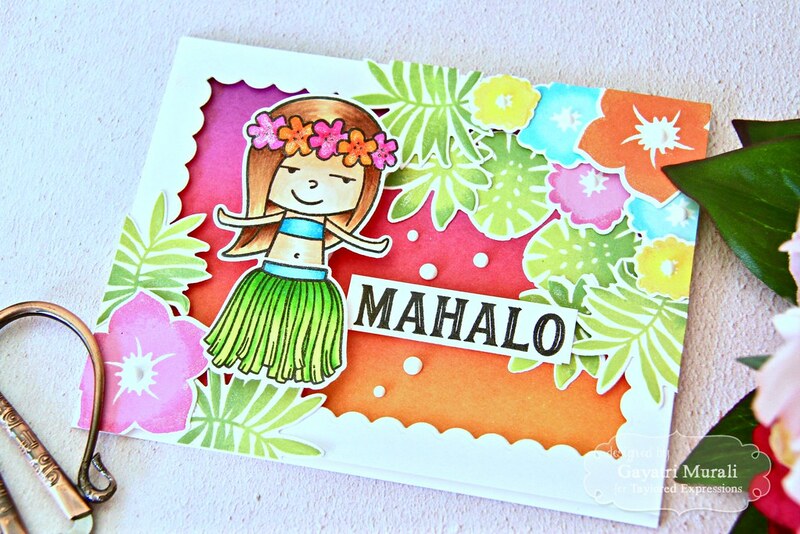 I created a tropical scene by sponging TE Lollipop, Guava and Candy Corn inks for the sunset background. 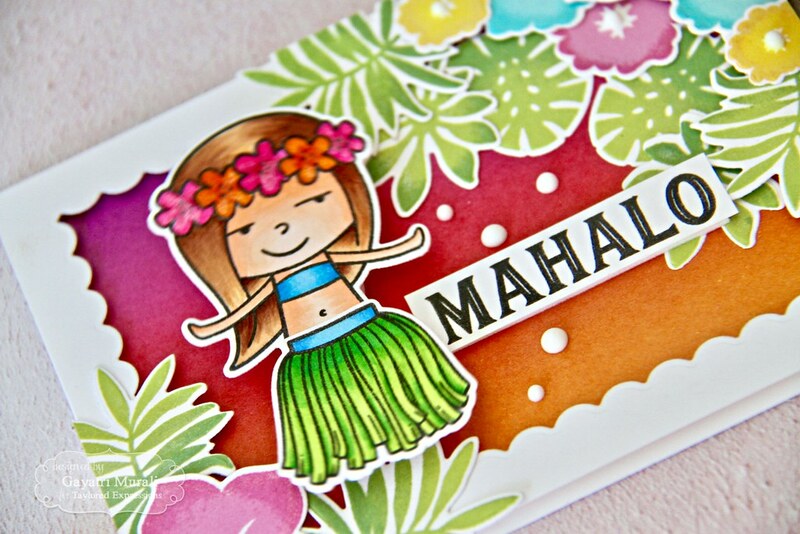 The stamped and copic coloured the Hula girl and her skirt. I adhered the skirt on her and added a mini wobbler on her back. I also brushed clear shimmer on the hula girl’s skirt and flowers on the head band. 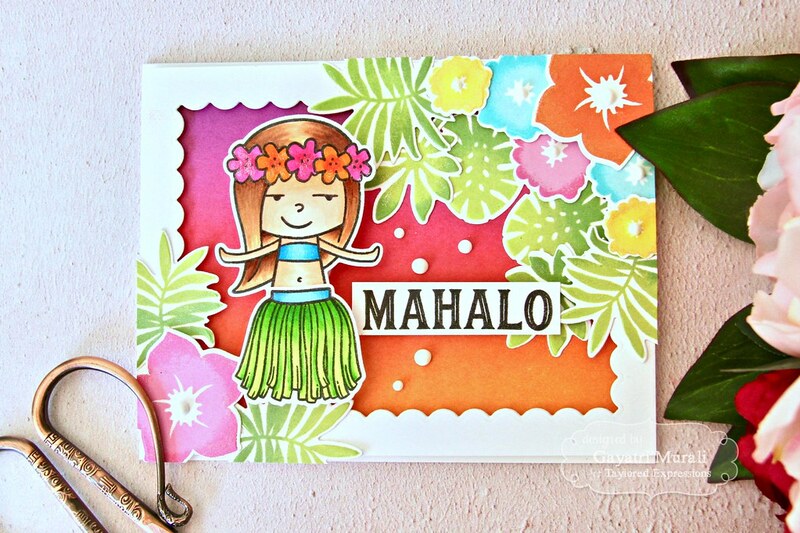 I stamped the sentiment from the Tropical Floral stamp set on a strip of Sugar Cube cardstock using Oreo ink. 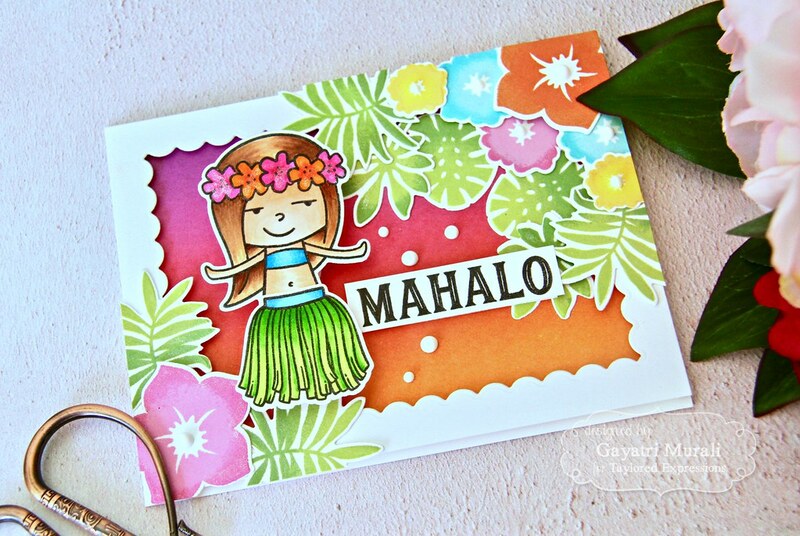 I also stamped multiple flowers and leaves from the Tropical Floral stamp set. To get depth, I used two shades are each colour and stamped using rock and roll technique. Using the coordinating dies I die cut the stamped images. To assemble the card, I trimmed a Sugar Cube panel to the size of the card front. The used the largest Inside Scallop Rectangle die to die cut the panel to make a frame. I adhered the frame on the sunset background card front using foam adhesives. Then made two floral clusters using the flowers and leaves die cuts and glued diagonally opposite to the frame. The larger cluster on the top right and smaller cluster to the bottom left. I adhered the Hula girl with the wobbler on the left side of the frame and the sentiment on the bottom of the large floral cluster. Finally added a few white Nuvo crystal drops. Here is the Hula girl in action. So hope you are inspired by my projects today. Here is the reminder of the promotions that is going on at TE store. Check out TE blog for design team inspiration. Thanks so much for stopping by and your love for past three days. Much appreciated! Happy shopping!